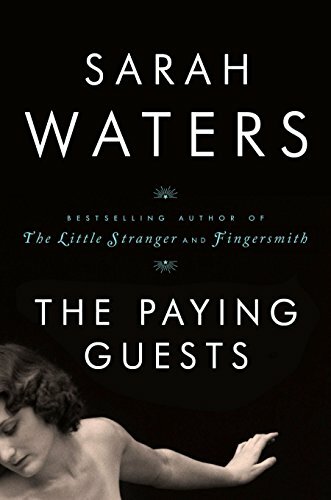 The Paying Guests by English author Sarah Waters is a brilliant novel. This book deserves the accolades and favorable reviews currently garlanding its release. Sarah Waters hits the high notes available to a consummate novelist at the height of her power—and happily her remarkable storytelling gifts make this book a memorable page-turner. My first read through was at a gallop, as I could not bear to relinquish the characters to the covers and stop reading. Almost immediately I finished the 576th page, returning to the beginning to read with appreciation the artistry evident on every page. In the early 1920s, post-WW1 suburban London, in a “good” neighborhood, in a once stately home presently succumbing to the ravages of time and the general griminess of the postwar years, we find the owners, Frances Wray and her mother. The once well-to-do family lost two sons in the war and a father consumed by grief and facing financial ruin through his own poor business judgments. Frances Wray, an intelligent and perceptive woman in her twenties—a suffragette, free thinker, and vehement anti-war activist—surrenders her freedom and independence to live with her mother and undertake the household duties of the “serving class”—“except the laundry”—in a losing battle against ever-encroaching poverty. Mother and daughter make a fateful decision to take in lodgers or “paying guests” as they describe their tenants to nosy neighbors. The “paying guests,” a young married couple, Lilian and Leonard Barber, in their twenties, arrive one early Saturday summer afternoon with a van load of belongings. They are of the “clerk class.” Leonard works at an insurance company in the city, and artistic but bored and housebound Lilian pours her creativity into designing and sewing clothes for herself and creating an eclectic almost bohemian décor in the upper floor of the staid house. The house seems to creak and groan as it accommodates to the upheaval of the domestic arrangement. The first half of the book develops the slowly blossoming friendship of the two young women from such different backgrounds. The consequences of this relationship and the unexpected twists and turns of the second half of the book are spellbinding. No spoilers here. As always (since Tipping the Velvet her first novel) Waters’ characters jump off the page into life, so real we feel we know them. Narrated in the third person through Frances’ point of view, a difficult perspective skillfully handled; we discern what Leonard, Lilian and the others think and feel—continually—every detail fits. All of Waters’ novels are uniformly excellent, but this one shines. The research is thorough; you know the neighborhood as well as Frances’ does and resonate with the physical drudgery of her domestic chores. London in the 1920s comes alive in ways I had not previously contemplated. The streets and bridges over the Thames are characters too. A second reading strikes one with the implications of moral responsibility inherent to the novel and the almost gentle way Waters’ enters into this tortuous territory. Crime and Punishment, the great Dostoevskyean fictional treatise of this thorny ground, pulverizes and perplexes like a Rembrandt painting. Certainly Frances Wray is no Raskalnikov nor Waters a Dostoevsky. Waters’ work is more like that of a miniaturist, a Dutch master painter of domesticity such as Vermeer. Each author has their milieu and each renders weighty matters of morality and conscience with deft strokes. For about the last ten years British writing has been experiencing a remarkable renaissance in literary fiction. Long may this movement flourish. Sarah Waters stands among the leaders. And this is one reader who cannot wait for her next book.